I haven’t given a book 5 stars in a long time. This year I’m at an all time low for 5’s and I don’t know what it is. I’m starting to think it’s me and that the 5 star book has become my white whale. I’m afraid I won’t see it again. That is what led me to Poison Study. Many of my Goodreads friends rated it very highly and I had to see if this would finally be the one. Unfortunately it wasn’t, but it was very close. Like seeing the tail of the whale in the distance it gave me hope that a 5 was out there. I just have to keep looking! Poison Study begins with Yelena who set to be executed for murder she readily confesses to. After a year in the dungeons she is ready to take her punishment. But when Valek offers her the position of food taster for Commander Ambrose she takes the chance of a slow poison over a quick death. I genuinely liked Yelena she reminded me a lot of Celaena Sardothian from the Throne of Glass series with her resourcefulness and attitude. 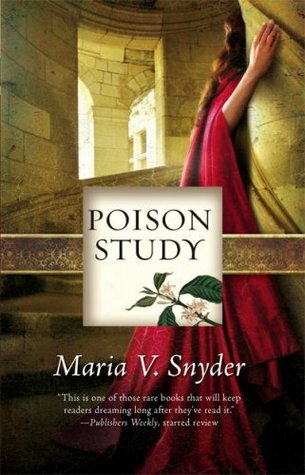 Actually Poison Study reminded me of Throne of Glass in general. There was political intrigue, a new world, and magic (which I wasn’t expecting from either novel but probably should have been). While I liked Yelena, Valek quickly became my favorite character. I’m a sucker for tall, dark, and killer. At first I was worried he would be portrayed as a one-dimensional hero but he quickly broke out of that mold and I was rooting for both him and Yelena. Overall, Poison Study was a gripping read. I enjoyed learning more about food tasting, poisons, and watching the relationship between Yelena and Valek develop. I will definitely be continuing the series with Magic Study. Hopefully, I will find my elusive 5 star! lol, you're a sucker for tall, dark, and killer? Cute.